The sleek Spencer bedroom set features a beautiful white lacquer finish, stunning nickel brushed finished hardware, and visually stimulating design details. 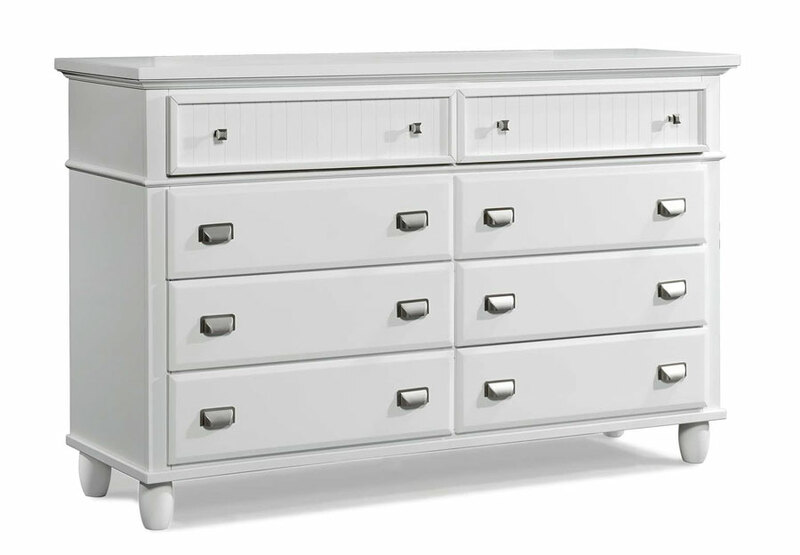 All case pieces are beautifully accented with hooded tops, fluting like details on the top drawers, and tapered feet. Felt lined top drawers, Kenlin Metal Glides, and French Dove Tail construction allow for durable case pieces. The chest has the added bonus of a lift top that features a mirror for added convenience. The headboard creates a wonderfully grand presence due to its impressive height. This group is sure to impress both on its sleek design and its quality craftsmanship.